Fans of The Legend of Zelda: Majora’s Mask will be excited to hear that there will be a nod to the N64 game in Super Smash Bros. for Wii U. 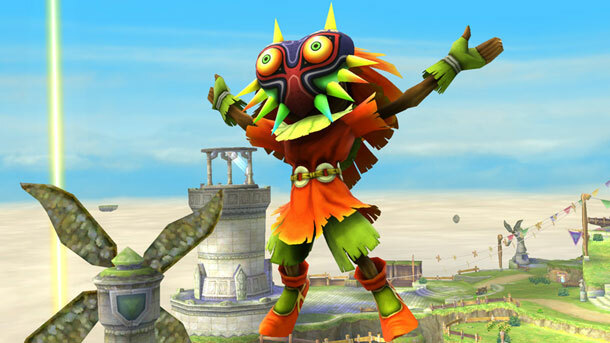 Although unfortunately not a playable character, Skull Kid will appear as an assist trophy. And, of course, he’ll be equipped with Majora’s Mask. It’s no secret that fans are longing to see the return of Majora’s Mask on modern consoles in the form of a remake and/or sequel, and maybe this nod to the game is a sign we should keep our fingers crossed. Super Smash Bros. isn’t the only recent Nintendo title to reference Majora’s Mask. Eiji Aonuma suggested that The Legend of Zelda: A Link Between Worlds would answer fan’s questions about the fate of Majora’s Mask. If anything, these little references to Majora’s Mask let us know that, at the very least, Nintendo hasn’t forgotten about it. Super Smash Bros. for Nintendo 3DS and Wii U, the latest entry in Nintendo’s ever popular Super Smash Bros. series, will be released sometime next year. As the title suggests, there will be a 3DS and a Wii U version of the game. The first trailer for the game was revealed at E3 this year, and since then more details have been trickling in, including some surprise characters like the Wii Fit Trainer and the return of some familiar faces like Captian Olimar. If you want to geek out on the Super Smash Bros. series and keep up to date on the latest news, be sure to check out oprainfall’s Smashing Saturdays. And if you we were wondering which new faces we wanted to see, check out oprainfalls’ Top 10 Most Wanted Super Smash Bros. Characters.